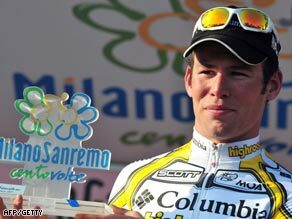 Cavendish was racing in the Milan-San Remo for the first time. Germany's Heinrich Haussler looked set to win the opening classic of the season until Cavendish surged forward to pip him on the line in a photo-finish. Team Columbia's Cavendish won four stages of the Tour de France last season, but victory in the 298-kilometer Milan-San Remo will cement his reputation as the fastest finisher in the sport. The 23-year-old from the Isle of Man is the first Briton since the legendary Tommy Simpson in 1964 to win a spring classic. Seven-time Tour de France winner Lance Armstrong, riding the first major race of his comeback, lost touch with the leading pack on the Cipressa climb near the finish in San Remo. "What a race! Fast, crazy, but great," Armstrong wrote on Twitter. "My legs felt good. Bad position at start of the Cipressa so my day was done. Good to get in close to 190 miles on the bike too. "Congrats to Cavendish on a spectacular victory," he added. At the famous Poggio climb which followed a group of about 60 riders were still in contention ahead of the six kilometer descent to the finish. Cavendish always remained well-placed in the charge for the line, but Haussler, who rides for Cervelo, looked set to have made the decisive move with 400 meters to go. Cavendish, who initially forged his reputation as a member of the all-conquering British track cycling team, closed him down in dramatic fashion with Haussler's Cervelo teammate Thor Hushovd in third place. "It's the most beautiful day of my life. I didn't expect to win. I couldn't dream of anything better," Cavendish told Eurosport.